If you are a regular reader of my blog you might notice that I haven't blogged for almost a month, it's partly down to my current lack of camera which is still driving me mad, I seriously need to invest in a lens! It's also down to a few bits going on in my personal life which have meant blogging hasn't been a top priority recently. As I have touched on in the past I suffer quite badly with anxiety, if anyone has suffered from anxiety you will know how debilitating it can be and what a huge effect it can have on your life. It's something i'm trying to move on from at the moment by undergoing a course of CBT and a few other stress management courses, I do think it's helping but obviously as with anything of this nature it's going to take a bit of time. I am so excited for the day that I only worry about 'real' problems and am not feeling like i'm going to be sick constantly! I know anxiety is something I will always have but being able to manage it and calm myself down will be a huge achievement for me, and a huge relief for the people that I am close to in life, my anxiety can be just as hard for them as it is for me! I have a few posts lined up for the next week, one of the reasons I started a blog was reading from other bloggers how it helped with their anxiety/depression/low self esteem and honestly this blog really does make me feel so positive when i'm regularly posting! As much as I write this blog for myself and my own sanity, it is still amazing to receive all the lovely comments and messages I get from you guys and nothing feels as good as when I get an email to say I have a new follower. 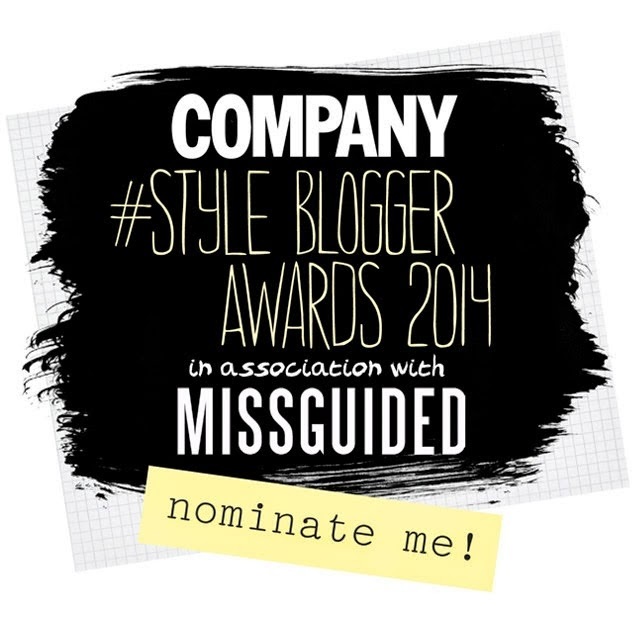 I don't really expect any recognition because I know I don't post that regularly but here is a link to the Company blog awards page, Company is one of my favourite magazines and Missguided is my favourite online shop so it's a match made in heaven for me!